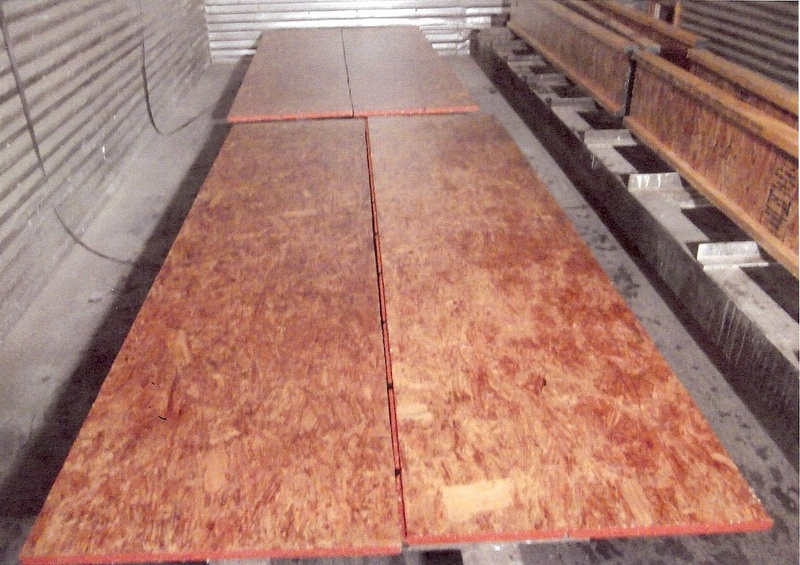 Oriented strand board (OSB) has a greater load-bearing capacity than milled wood panels. OSB is particularly suited as sheathing on walls, floors, sub-flooring, roof decking and is a versatile, less expensive alternative to plywood. Flame Safe fire retardant OSB sheathing is manufactured from layers of thin wooden strips, arranged in cross-oriented layers, compressed and bonded together with synthetic resin adhesives and wax, and Flame Safe fire retardant coated. The OSB wooden strips are usually from the Poplar and Aspen trees, but can also be from the fast growing and smaller trees. OSB panels have similar properties to plywood, but OSB has no internal gaps or voids, is uniform and less expensive. Flame Safe fire retardant OSB (oriented strand board) and rim board is particularly suitable for load bearing applications and is Class A fire rated. This is especially important for commercial, industrial or residential applications to assist compliance with the new 2012 I.R.C. section R501.3 exception 4 fire rated assembly code requirements (ASTM E119 Fire Test of Building Materials). Hourly ratings are assigned to only complete assemblies of structural materials for buildings, including walls, floors, ceilings and roofs. It is important to note that hourly ratings have no reference to any single component of a complete assembly. Flame spread ratings are based on the ASTM E84, ANSI/UL723, NFPA 255: Test for Surface Burning Characteristics of Building Materials (the ASTM E84, UL723 and NFPA 255 are the same), the test measures the rate which the flame spreads over the substrate being tested (test specimen) and the degree of smoke developed. Classification rating are [ASTM E84 CLASS A, UL723, TYPE I] f.s. 0-25 [ASTM E84, CLASS B, UL723 TYPEII] F. S.26 -75 and [ASTM E84, CLASS C, UL723 TYPEIII] F.S. 76-200. The flame spread rating is determined in the first 10 minutes of the test. The ASTM 2768-11 TEST FOR EXTENDED DURATION SURFACE BURNING CHARACTERISTICS OF BUILDING MATERIALS, This standard uses the apparatus and procedure of test method ASTM E84 with the total test period extended to 30 minutes. The Flame Safe high intumescent fire retardant swells as a result of heat exposure, converting combustible gases and tars to non-combustible carbon char causing the surface to bubble-up and thereby creating a barrier between the fire and the treated material. The carbon char is a poor conductor of heat, thus protecting the substrate. This test method provides the relative flame spread of experimental coatings using small test specimens. By calibrating the 2-foot tunnel with Test Method E84-rated fire retardant coating, results obtained by this test method should be indicative of those obtained with the large specimen in the Test Method E84 tunnel. This test method determines the protection a coating affords its substrate and the comparative burning characteristics of coatings by evaluating the flame spread over the surface when ignited under controlled conditions in a small tunnel. In addition to the experimental flame spread rate, the weight of panel consumed, time of afterflaming and after-glow, char dimesions, index, and height of intumescence may be measured in this test. The advantage of Flame Safe OSB is it's shear value, through it's thickness, is twice that of plywood and it's zero flame spread rating thus Flame Safe OSB is the product of choice for webs of wooden I-joists. Careful storage and handling is required to maintain the integrety of the OSB, thus the OSB panels should be protected from rain and accidental soaking. Store flat in an enclosed, dry building - OSB can be cut by a hand or power saw. Most fire retardant products presently on the market do not have testing by accredited third party testing agencies to back their claims. Flame Safe’s fire retardant products have been tested by accredited third party testing agencies. Flame Safe warrants it’s products to perform as tested and will furnish test reports upon request, in addition to those published on our web site. FLAME SAFE CHEMICAL manufactures a complete line of fire retardant coatings, fire retardant penetrants and fire retardant sprays that meet or exceed industry’s fireproofing standards. The effectiveness of Flame Safe’s fire retardant products are well documented. The uniqueness of FLAME SAFE’s fireproof products are not only their simplicity of application, their low cost, their environmental safeness, their tested proven certifications, but most importantly they are required by code. Fire codes are written and enforced to save lives and property. Uniquely, FLAME SAFE’s fire retardant coatings, sprays and penetrants are easily applied, colorless, non-toxic, environmentally safe, and are aqueous based fire retardant chemicals. 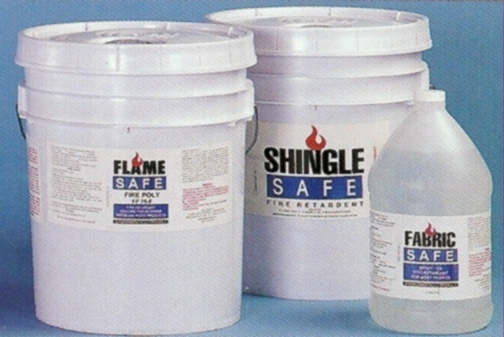 FLAME SAFE has both interior and exterior fire protection coatings, penetrants, and fire retardant sprays for wood, wood products, architectural millwork, molding and trim, lumber, plywood, wood shingles, timbers, fiberglass and plastics, fabric, theater curtains, drapes, upholstery, mattresses and bedding, thatch, thatching, tiki huts, paper, cardboard and packaging systems for combustible liquids. The Fire Buster™ is a fire retardant treated fabric available for commercial and residential use. FLAME SAFE is dedicated to setting not merely following the fireproof industry standards through ongoing research development and testing programs. FLAME SAFE continually endeavors to educate the marketplace on the significance of fireproofing combustible materials through the use of fire retardant products. Montgomery,Alabama; Birmingham, AL; Huntsville, Alabama; Mobile, Alabama; Tuscaloosa, AL; Anchorage, Alaska; Fairbanks, Alaska; Kodiak, Alaska; Juneau, Alaska; Flagstaff, Arizona; Grand Canyon, AZ; Phoenix, Arizona; Tuscan, Arizona; Yuma, AZ; Camden, AR; Little Rock,Arkansas; Fayetteville, Arkansas; Fort Smith, Arkansas; Texarkana; AR; Anaheim, California; Bakersfield, CA; Bishop, CA; Fresno, CA; Irvine, CA; Long Beach, California; Los Angeles, CaliTallahassee, fornia; Oakland, CA; Modesto, CA; Monterey, CA; Oakland, California; Oxnard, CA; Palm Springs, CA; Pasedena, California; Redding, CA; San Diego, CA; Sacramento, California; San Francisco, California; San Jose, CA; Santa Barbara, California; South Lake Tahoe, CA; Stockton, California; Aspen, Colorado; Denver,Colorado Colorado Springs, Colorado; Durango, CO; Fort Collins, CO; Grand Junction, CO; Gunnison, Colorado; Lamar, CO; Montrose, Colorado; Pueblo, CO; Steamboat Springs, CO; Telluride, Colorado; Bridgeport, CT; New Haven, Connecticut; New London, CT; Hartford,Connecticut; Dover, Delaware; Wilmington, Delaware; Washington DC; Daytona Beach, Florida; Fort Lauderdale, FL; Fort Meyers, Florida, Fort Walton Beach, FL; Gainesville, Florida; Jacksonville, FL; Key West, Florida; Melbourne, FL; Miami, Florida; Naples, FL; Orlando, Florida; Panama City, FL; Pensacola, Florida; St. Petersburg, FL; Sanford, FL; Sarasota, Florida; Tallahassee, Florida; Tampa, Fl; West Palm Beach, Florida; Clearwater, Fl; South Beach, FL; Albany, GA; Athens, Georgia; Atlanta, Georgia; Augusta, Georgia; Columbus, GA; Macon, Georgia; Savannah, Georgia; Valdosta, GA; Hilo, HI; Honolulu, Hawaii, Hoolehua, Hawaii; Kahului. HI; Kaailua Kona, HI; Kamuela, Hawaii, Kapalua, Hawaii; Lanai City, HI; Lihue, HI; Princeville, Hawaii; Boise, Idaho; Coeur d'Alene, Idaho; Idaho Falls, Idaho; Lewiston, ID; Sun Valley, Idaho; Twin Falls, Idaho; Aurora, IL; Bloomington, IL; Champaign, Illinois; Chicago, Illinois; Danville, IL; Marion, Illinois; Marion, Illinois; Mount Vernon, IL; Peoria, Illinois; Quincy, IL; Rockford, IL; Springfield, Illinois, Sterling, IL; Wheeling, Illinois; Bloomington, Indiana, Butler, IN; Evansville, Indiana; Fort Wayne, IN; Gary, Indiana; Indianapolis, Indiana; Lafayette, IN; South Bend, Indiana; Terre Haute, Indiana; Burlington, Iowa; Cedar Rapids, Iowa; Des Moines. Iowa; Dubuque, Iowa; Fort Dodge, Iowa; Mason City, IA; Mason City, IA; Sioux City, Iowa; Waterloo, Iowa; Dodge City, Kansas; Garden City, KS; Great Bend, KS; Hays, Kansas; Manhattan, Kansas; Salina, Kansas; Topeka, Kansas, Wichita, KS; Kansas City, Kansas; Lexington, Kentucky; Louisville, Kentucky; Owensboro, KY; Paducah, KY; Alexandria, LA; Baton Rouge, Louisiana; Lafayette, Louisiana; Lake Charles, LA; Monroe, LA; New Orleans, Louisiana; Shreveport, Louisiana; Augusta, Maine; Bangor, Maine; Bar Harbor, ME, Portland, Maine; Rockland, Maine; Annapolis, Maryland; Baltimore, Maryland; Cumberland, MD, Hagerstown, MD; Ocean City, Maryland; Salisbury, MD; Boston, Massachusetts; Edgartown, MA; Hyannis, Massachusetts, Hyannis, MA Lawrence, MA; Nantucket, Massachusetts;New Bedford, MA; Plymouth, MA; Massachusetts; Providence, Massachusetts; Springfield, MA; Worcester, Massachusetts; Battle Creek, Michigan; Detroit, Michigan; Flint, Michigan; Grand Rapids, hancock, Iron Mountain, Kalamazoo, Lansing, Marquette, Menominee, Muskegon, Pellston, Pontiac, Saginaw, Traverse City, Michigan; Bemidji, Minnesota; Brainerd, Duluth, Fairmont Fergua, Grand Rapids, Hibbing, International Falls, Minneapolis, Minnesota; Rochester, Thief River Falls, Minnesota; Columbus, Mississippi; Corinth, Greenville, Gulfport, Jackson, Mississippi; Laurel, Meridian, Tupelo, Mississippi; Cape Girardeau, Missouri; Columbia, Joplin, Kansas City, Missouri; Kirksville, St Louis, Missouri; Springfield, Missouri; Billings, MT; Bozeman, MT; Butte, Montana, Glasgow, MT; Great Falls, Montana; Helena, Montana, Kalispell, MT; Lewistown, MT; Miles City, Montana; Missoula, Montana; West Yellowstone, Montana; Wolf Point, MT; Allaince, Nebraska; Chadron, Grand Island, Nebraska; Hastings, Kearney, Lincoln, Nebraska; Norfolk, North Platte, NE; Omaha, Nebraska; Scottsbluff, NE; Sidney, Nebraska; Elko, Nevada; Ely, NV; Las Vegas, Nevada; Reno, NV; Keene, New Hampshire; Laconia, NH; Lebanon, New Hampshire; Manchester, New Hampshire; Atlantic City, New Jersey; Newark, NJ; Trenton, New Jersey; Albuquerque, New Mexico; Carlsbad, NM, Clovis, New Mexico; Farmington, New Mexico, Gallup, NM; Los Alamos, NM; Roswell, New Mexico, Santa Fe, New Mexico; Albany, New York;, Buffalo, Inslip, New York; Ithaca, NY; Jamestown, New York, Long Island City, NY, New york, New York, Niagara Falls, NY; Plattsburgh, NY; Rochester, NY, Syracuse, New York; Utica, New York, Watertown, NY; White Plains, New York; Charlotte, North Carolina, Fayetteville, NC; Greensboro, North Caroling; Jacksonville, NC; Kinston, NC; Mante, NC; Pinehurst, NC; Raleigh, North Carolina; Wilmington, North Carolina; Winston-Salem, North Carolina; Bismarck, North Dakota; Fargo, ND; Grand Forks, ND; Jamestown, North Dakota; Minot, ND; Williston, North Dakota; Akron, Ohio, Cincinnati, Ohio; Cleveland, OH; Columbus, Ohio; Dayton, Ohio, Toledo, OH; Wilmington, OH, Youngstown, Ohio; Enid, Oklahoma; Lawton, OK; McAlester, OK; Oklahoma City, Oklahoma; Ponca City, OK; Tulsa, Oklahoma; Eugene, Oregon; Klamath Falls, Oregon, Medford, North Bend, Pendletoon, Portland, Oregon; Redmond, OR; Salem, Oregon; Allentown, Pennsylvania; Bradford, PA; Du Bois, PA; Erie, Pennsylvania; Franklin, PA; Harrisburg, PA; Lancaster, PA; Philadelphia, Pennsylvania; Pittsburg, PA, Reading, PA, Williamsport, Pennsylvania; Block Island, Rhode Island; ; Providence, RI; Westerly, Rhode Island; Anderson, South Carolina; Charleston, South Carolina; Columbia, South Carolina; Florence, SC; Greenville, SC; Hilton Head Island, SC; Myrtle Beach, South Carolina; Aberdeen, South Dakota; Brookings, SD; Huron, South Dakota; Rapid City, SD; Sioux Falls, South Dakota; Watertown, SD; Chattanooga, Tennessee; Jackson, TN; Knoxville, Tennessee;, Memphis, Tennessee; Nashville, Tennessee; Abilene, Texas,Amarillo, TX; Austin, Texas; Beaumont, TX; Brownsville, Texas; College Station, TX; Corpus Christi, Texas; Dallas, El Paso, TX; Fort Worth, Texas; Houston, Texas; Killeen, TX; Laredo, TX; Longview, Texas; Lubbock, TX; Lufkin, TX; McAllen, TX; Midland, Texas, Odessa, TX; Paris, Texas; San Angelo, TX; San Antonio, Texas; Tyler, TX; Waco, Texas; Wichita Falls, Texas; Blanding Utah; Cedar City, Utah; Delta, UT; Fillmore, UT; Kanab, UT; Milford, UT; Monticello, Utah; Mount Pleasant, Utah; Nephi, UT; Price, UT; Richfield, UT; Roosevelt, Utah; St. George, Utah; Salina, UT; Salt Lake City, Utah; Wendover, Utah; Burlington, Vermont; Rutland, Vermont; Charlottesville, Virginia; Danville, VA; Hot Springs, VA; Lynchburg, Virginia; Newport News, Virginia; Richmond, VA; Roanoke, Virginia; Anacores, Washington; Bellingham, WA; Center Island, WA; DEcatur, Washington. Eastsound, WA; Friday Harbor, WA, Kenmore, W, Lopez, Washington; Moses Lake, Washington; Oak Harbor, Port Angeles, Washington; Richland, WA; Roche Harbor, WA; Seattle, Washington; Spokane, Washington; Stuart Island, WA; Waldron, WA; Walla Walla, Washington; West Sound, Washington, Yakima, Washington; Beckley, West Virginia; Bluefield, WV; Charleston, WV; Clarksburg, West Virginia; Elkins, WV; Greenbriar, WV; Huntington, West Virginia; Morgantown, West Virginia; Parkersburg, West Virginia; Appleton, Wisconsin; Eagle River, Eau Claire, Wisconsin; Green Bay, Wisconsin, Janesville, LaCrosse, Wisconsin; Madison, Wisconsin; Milwaukee, Wisconsin. Oshkosh, Wisconsin; Rhinelander, Wisconsin; Sturgeon, Wisconsin; Wausau, Wisconsin; Casper Wyoming; Cheyenne, Wyoming; Cody, WY; Gillette, WY; Jackson, Wyoming; Laramie, WY; Riverton, WY; Rock Springs, Wyoming; Sheridan, Wyoming; Worland, Wyoming; Nassau, Bahamas; San Juan, Puerto Rico; Charlotte Amalie, Virgin Islands; St. Thomas; St. Croix; Edmonton, Alberta, Canada; Victoria, British Columbia, Canada; Winnipeg, Manitoba, Canada; Fredericton, New Brunswick, Canada; Saint John's Newfoundland, Canada; Yellowknife, Northwest Territories, Canada; Halifax, Nova Scotia, Canada; London, Ottawa, Toronto, Ontario, Canada; Charlottetown, Prince Edward Island, Canada; Montreal, Quebec, Canada; Regina, Saskatchewan, Canada; Whitehorse, Yukon, Canada.